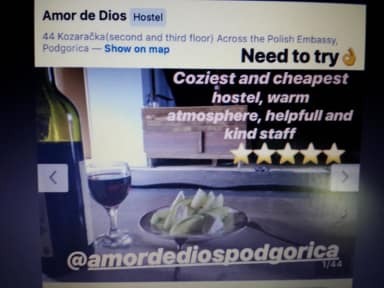 Amor de Dios i Podgorica, Montenegro: Reservér nu! Many people has no any idea about PG. We have river and you can swim and sunbath at the river in day time. The river is max. 20-25 minutes away on foot from here. And I would say to swim in the river is very enjoyable because there is current in the river. So you must come here with sea clothes. In the evening you can find cafe, pub etc. and beer that is 50 cc is just 1.5 euro. Also cigarette is so cheap here. And you must try our alcohol that is Rakia. You can also cook at the kitchen easily. Stari Aerodrom is located behind the Main Bus Station. Distance from Main Bus Station to Amor de Dios is max. 15 minutes by walking. From Amor de Dios to center is just 20 minutes by walking. Transfer from airport to Amor de Dios is just 7 euro. ACROSS THE POLAND EMBASSY. 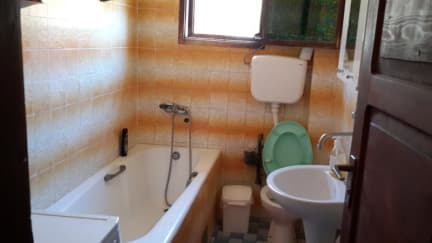 We serve basic needs such as Wi-Fi, hot water, hosting for backpackers and hitchhikers.